Last year’s lively Easter worship service. Families meet the Easter Bunny at last year’s egg hunt. South Biscayne Fellowship Church has been making the most of their centralized North Port location and spreading joy and messages of hope to all those around them. A few years ago, the original church merged with Fellowship churches, joining an organization that spans 13 campuses over three states, as well as centers in prisons and online. “Our church has had a local reach here for over 40 years, so the opportunity to become a fellowship church over the last couple years has been a chance for us to have an even bigger reach than before,” worship leader Courtney West said. Her husband and location pastor, Mitchell West, added: “We’re excited that we have the privilege of having a global reach, a national reach and a local legacy here in the community in which God has placed us,” said location pastor Mitchell West. Thanks to a long standing in the community, the church enjoys a wide variety of members — from kids and students all the way through middle age and retirees. “We like to say we’ve got people from 0 to 100 here, excited and desiring to see what God has next for their lives,” said Mitchell West. And they offer something for all of them. Every Sunday, South Biscayne has a program designed specifically for babies up through fifth-graders to help get them started on their journey through faith at an age-appropriate level. From there, middle and high school students have their own programming. “In all of the different environments we have a blast and learn about how we can live the best life that God has for us,” Mitchell West said. Services are also specially designed to reach the wide range of congregants, with one offered at 10:30 a.m., and one at 11:45 a.m.
“You would consider them more contemporary but they appeal to a lot of audiences. We like to switch it up so you might here some traditional stuff but you’ll also here some really new, relevant stuff. You never know what to expect,” said Courtney West. In fact, one series coming up this summer, according to Mitchell West, is called “At the Movies” and focuses on taking well-known Hollywood blockbusters and discussing how actions or themes within the films teach both good and bad..
“It’s something we do every so often, it’s a lot of fun. We turn the church into a movie theater,” Mitchell West said. One of their biggest events of the year, however, is coming up in just a few short weeks, when thousands of brightly colored eggs will fall from the sky. 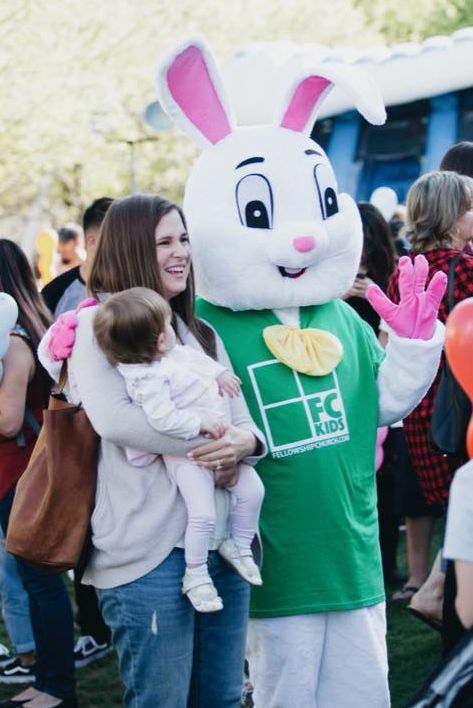 “On Easter weekend, we’ll have a big helicopter egg drop, we’ll have Easter egg hunts for kids, we’ll have really incredible music, great preaching and it’s just a great for families to come and hang out,” said Courtney West. Free professional photos will also be available for those looking for another holiday treat. Each hunt starts right after the 10:30 a.m. and 11:45 a.m. services, where the organizers will give directions to participants. For more information, visit fellowshipchurch.com/south-biscayne. “Come hang out with us, we would love to have us join you,” Mitchell West said. Sunday service: 10:30 and 11:45 a.m.
Good Friday service: Friday, April 19 at 7 p.m.